I started out as an enthusiastic sales negotiator working for The Prudential along the Askew Road and then for various agents in Chiswick and Hammersmith. This allowed me to see a gap in the market and the need for a good local Estate agency in Shepherd’s Bush, which I opened in 1993 at 75 Goldhawk Road. It was hard work as it was mid-way the property recession; however, by opening the business at this time, it gave me the incentive and resilience required for success. Over the coming years, the agency built a long-standing client base and a reputation as trustworthy and reliable, with knowledgeable, technically proficient and highly professional staff who, I am delighted to say, remain loyal to this day. The company expanded into the lettings market when my brother, Sean, joined to head up a busy Lettings Department followed with the equally able Audrey Sexton in 2010; Susanna Garcia-Diez joined to head up the property management department. Our growth has been progressive and this has lead to our momentous move to our unique offices at 77 Goldhawk Road in 2015. Originally the British Prince Public House, this magnificent building had been part of the Shepherd’s Bush community since 1898. There is no doubt the property industry has changed beyond recognition. Shepherd’s Bush and Hammersmith have seen a major transformation from being a tired, grubby inner-city area to one of the most desirable areas in London in which to live and work. Evolving with the changes and working with the local community have been at the forefront of our success. Kerr & Co has always had a strong commitment to the community and the local area and has sponsored local school fetes, Christmas fairs, council projects and charitable causes. We are proud to have been the principal sponsors of Shepherd’s Bush Cricket Club for the best part of 5 years and have donated to the Scout organisation and Residents’ Associations, keeping our humble beginnings in mind. I still run the company with the same commitment to service and loyalty to clients and am assisted by my exceptional team, most of whom have lived or still live in the area. 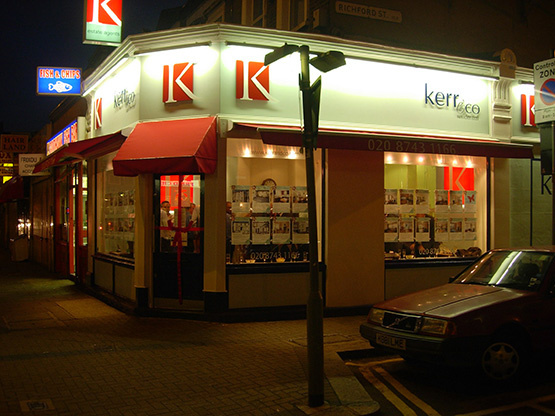 Kerr & Co’s unique knowledge, ability and attention to detail constantly keeps us one step ahead of our competitors.